Fine chocolate making that combines great experience, refinement, and the excitement of the new. Franck Morin is the youngest in a long line of fathers and sons to uphold the traditions of fine artisanal chocolate making at his family’s Chocolaterie Morin in Donzeres, France. This interview is a follow up to my interview with Arnaud Stengel of Erithaj, in which I wrote about how excited I was by these two young chocolate makers, their collaboration, and their delicious chocolate. Erithaj is brand new, with Morin’s experience behind it. Chocolaterie Morin has been making chocolate since 1884, so has all the experience possible. 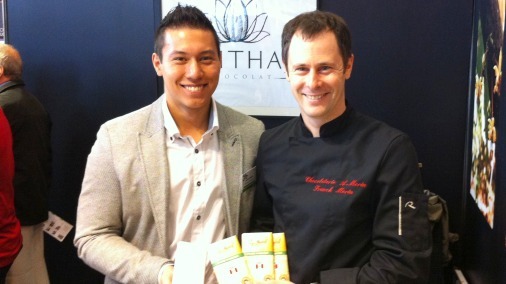 It also has the dynamic Franck engaging in chocolate making in the present day with fantastically delicious results. Tell me about your life before chocolate. When and why did you decide to start making chocolate? As you know, The Chocolaterie A. Morin is a family business. I’m the 4th generation working in the chocolate. My great grandfather Gustave Morin was working in a chocolate business he started in 1884. My grandfather André was working in that chocolate business, he decided to quit and build his own business in 1958. It was the birth of the Chocolaterie A. Morin. My father learned with my grandfather, and I learn with my father. Since 1958 there are two activities in our company the chocolate and confectionary in one hand and the farm in the other hand. We a run a farm too! We produce our almonds, nuts, and cherries to produce our bonbons. I started to put my hand in the chocolate maybe around 5 years old, I can’t remember. I’ve always been interested in chocolate, when I was a little boy maybe more in eating than in making. I have to thank my father for letting me do lots of things like cooking the toffee and the praline, even if it could be little dangerous for a little boy. 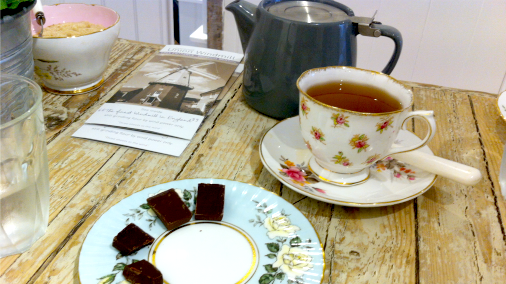 But you can be sure that for me the Chocolaterie was far more a place to play than a work place. In the past the activity was very seasonal for Christmas and Easter. During the rest of the year we had lots of things to do in the farm. As I was always very curious and concerned about the chocolate, my father brought me to different chocolate fairs, we visited other chocolate companies, and machinery suppliers, which is good to learn. I read lots of professional newspaper and books. After my studies I had the opportunity to work in a big chocolate factory or to go to one cocoa producing country to a cocoa farm for 4 months. I choose to go to the cocoa producing country. It was in São-Tomé & Principe. At that time I was not sure whether to continue to work in the family business. 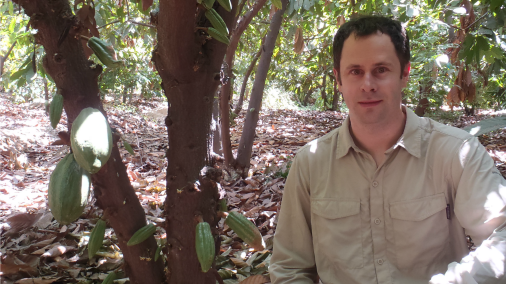 During this time in São-Tomé I discovered lots of things concerning the fermentation, the drying process… I was surprised about the diversity of the cocoa trees and more importantly about the different taste it is possible to find by eating the white pulp in the cocoa pod. I think this really changed my point of view concerning the chocolate. It was a new way of thinking for me. Find small lot of beans, from a small area or farm, and sometimes from specific orchards. Doing small batch chocolate, modify the process to preserve as much as possible all the characteristic of the cocoa beans. Working with respect of what nature gives to us and respect the work of the farmer. It made sense for me, since then, I knew what I wanted to do. 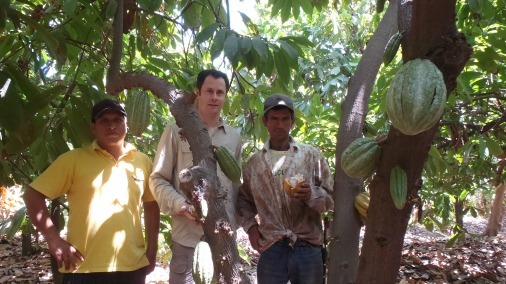 Franck with some of the cocoa farmers he works with. My idea is to develop as much as I can the potential of the cocoa beans. For me developing doesn’t means change. I can say I respect the product; if some step needs time I take time, if sometimes a fault in the beans could be deleted I don’t do so. Some small faults are a part of the identity of the beans. I selected the machinery very precisely and I choose the machinery which works with the least undesired impact on the chocolate, even if it can be one much more important investment. Finally it is lots of small details that make the difference. 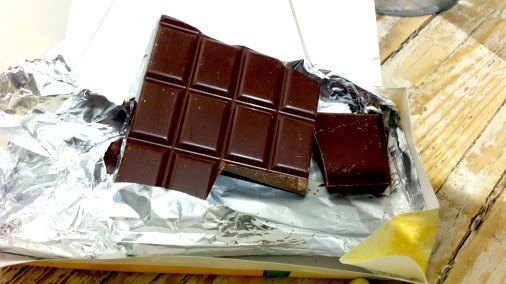 There are 100 ways to do chocolate from the beans; I don’t say my way is the best. But the way I choose fit me, my sense, my feeling, it is very personal. I am very open when I process cocoa beans. At the beginning I have no idea about the profile of the process I will do. For example before roasting I eat some beans then I start to think about the roasting parameters, but these parameters may change during the roasting (increasing, decreasing the temperature, change the time…). During the roasting I start to have one idea about the recipe, during the conching I adapt the parameters… finally I’m close to the product and I adapt to it. Of course it takes lots of time; this is my way of working. Paying close attention to the beans. It is rare to be making bean-to-bar chocolate, it must have been a steep learning curve for you. What have been some of your greatest discoveries? When I had the opportunity to read some recipes and old professional books from my grandfather. It was really passionate. Now the chemistry and more generally science can explain many more things than in the past. I need lots of knowledge, I need to understand what is happening, and I need to experiment. For me I learn everyday but it is true sometimes there are some steps. I can say each time I have a new machine in production you have to learn how to do the best with this machine and at the beginning you might make some faults. Sometimes when you understand a fault, or what is happening, that can make your knowledge increase very fast. The first time in cocoa plantation as I said before. 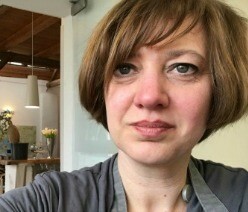 But more regularly when I have the opportunity to meet some other chocolate maker and when we are speaking together. And the third this is when I have some challenge like for example this last summer one of my friend chocolate makers asked me to do chocolate with his own machinery. You also have a collaboration making chocolate for Erithaj, tell me something about that. In the beginning it started with the Stengel Family. Arnaud’s mother is Vietnamese and left her country very young due to the war. Some years later, she had the idea to do something for her country. Then all the Stengel family started to support this idea. Arnaud’s father (André) and my father(Jean-François) knew each other. André asked for some information about the cocoa, the cocoa trees, the plantations… We are always very enthusiastic with this kind of project. Some time later, we received some cocoa. We made some samples and gave some feedback and advice… When Arnaud finished his studies he joined the project full time. This is when I met Arnaud. We are both passionate, immediately we became friends. We work very closely, I asked Arnaud to do some tests during fermentation, he asked me to do some tests during processing. As he is often in Vietnam for long periods he has time to do lots of tests. It is very good to experiment, we learn a lot. The recipes I do for Eirthaj are developed together, this is really the profile Arnaud wants. Finally, I consider myself lucky to be part of ERITHAJ’s adventure. We have more than a Client/Suppliers relationship, we are friends first of all. For me the big change comes from the final consumer. Now the consumer is very curious, they are questioning, they are testing they are more and more educated. For me this is very good, they understand why from one chocolate to another you can have different taste. I think the chocolate, especially the single origin bars are changing. In the past they were reserved for “expert” consumers, now they are for everybody. We as chocolate makers must take time to speak about what we are doing, we have to teach the consumer about the diversity of the chocolate. For the professionals some understand very early that the chocolate is not only chocolate. There is diversity in variety, climate, ground, weather, post harvest process… That is why some professionals now take time to look around, and take time to find the unique chocolate which will marry perfectly with the other ingredients in their recipe. That is a very difficult question! I think some products only focusing on marketing will disappear. 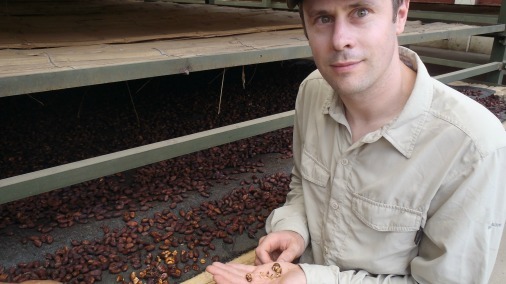 We will see more suppliers of single origin, single plantation chocolate all over the world. The next step I’m sure in the near future; we will see new artists using great quality chocolate to do wonderful pastry, dishes and bonbons. I already see that when I visit my friends, now they are using some of our chocolate as a rare and precious ingredient with its own specificity. For example one of my friend in Strasbourg uses our Chanchamayo couverture to do a Menton Lemon ganache And the result is just unbelievable. He tried some other single origin cuoverture; the result was interesting, but with the Chanchamayo it was much better. He did the same for all the citrus fruit collection; each fruit was used with a different couverture. 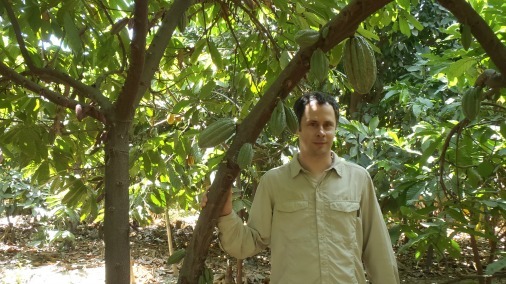 Franck on a cocoa plantation, the site of much learning. 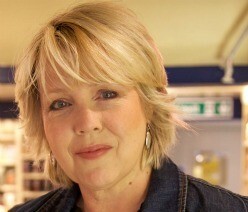 Yes I like good food and as I’m curious I’m always interested to try. I’m especially curious to discover traditional dishes. In Peru I’m keen on “ceviche” “anticutcho” and “sopa de pollo”. 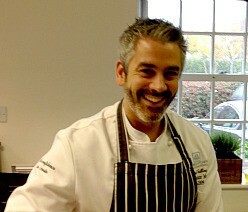 Now I supply some chefs I have the opportunity to discuss with them in the kitchen (and try what they do). I discover lots of things that are very interesting, but this is not my art, I can only eat! Have your palate and feelings about chocolate changed since you started? I think yes. First, because to do my job I have to taste all the time the beans during roasting. As you know eating a hot bean during roasting the taste is very strong, intense. If you don’t take care step by step your chocolate is stronger and stronger. That is why we regularly organize tastings with some friends who are not professionals; then you can see if your feelings are changing. Second because I learn every day. I am sure that several years ago I would have had different ideas about how to transform a bean than today. 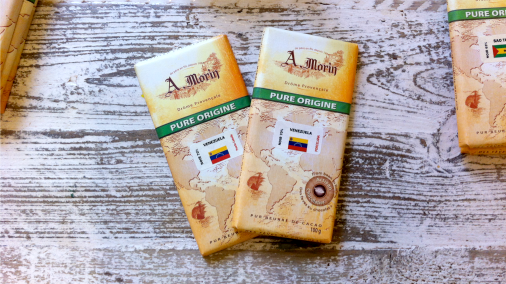 What is coming next for Morin chocolate? What plans do you have for the chocolate and for your business? We are working to find new beans to try, as always (some Peru Chuncho are on the boat). Today I’m trying some beans from Cameroun. I’m waiting on beans from Colombia… I have a dream to build a new factory… And I need to take time to do some fairs, to find distributors, to work on the website… but this is not my passion. My mother makes an incredible chocolate mousse; a single origin chocolate in a simple recipe, rich in aromas. It is just unbelievable. Thank you so much Franck, wonderful to have your stories and insight. 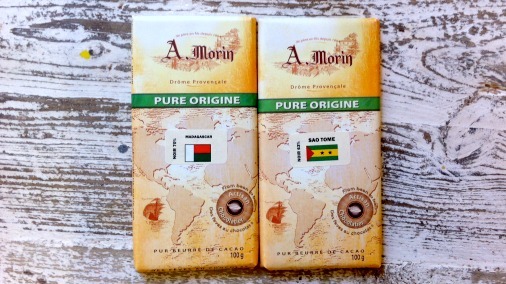 I prepare to pay some proper attention to A. Morin’s single origin bars. So what of the chocolate? Franck generously sent me a parcel of his glorious chocolates to taste. All show the mark of a master chocolate maker, with a superbly smooth texture and melt. Each is absolutely distinct in its flavour profile, complex and full flavoured, but with great balance. 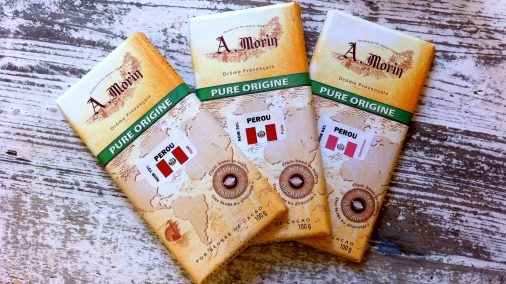 Three bars from three origins within Peru. Three bars from Peru show the diversity of the country’s cacao, and offer truly thrilling flavours. Perou Noir 63% Chanchamayo has an aroma of toasted nuts, and a dark, creamy caramel flavour. There is a hint of fruit, apricots and raisins, and the finish is like the perfect cup of hot chocolate. Perou Noir 70% Piura has a glorious pale colour and is the brightest of the three. There is such a light, fragrant, green quality to this chocolate, with tons of fruit, like raspberries and cream. This is rounded out with fudgey notes and a cafe au lait ending. Quite delicious! Perou Noir 70% Toumi is also fruity, but deep and plummy, with warm gentle spices, cinnamon and a drop of ginger. There is malt in the mix too, and the ending is mellow with a deep cocoa hit. An absolutely superb chocolate, and in contention for my favourite bar of the whole tasting. The Venezuelan 70% Noir Porcelana has the clean simplicity a porcelana should have. It is smooth and gentle, slow to develop, but then has some fruit, strawberry, and a lots of mild nuttiness. For me the nut here is cashew which is added to the toasted biscuity flavours of feuillentine. The Venezuela Noir 70% Puerto Cabello has a bright start. It may seem odd to describe a chocolate as juicy, but this truly is, it makes the taste-buds sing. It is full of the flavour of dried cherries and dark caramel. Fabulous. One each from Madagascar and Sao Tomé. Two very different chocolates from these last two origins. Sao Tome Noir 63% is not the most complex of the bars. But delicious nonetheless. It has coffee and cream, toasted fudge, the walnut cake of chocolate bars. Madagascar Noir 70% has caramel and fruit in the aroma and is a gloriously fruity. Madagascan cacao is celebrated for its red fruit notes, here I found not so much berries, but cherries in abundance. This chocolate is full of cherries, almonds and has a delicate floral note, of elderflower. Another absolute winner. Chocolate this well made is a joy to all the senses, and worth seeking out. These bars represent a stunning collection of single origin chocolates from a true master of the art. Thank you Franck for such a delicious tasting.